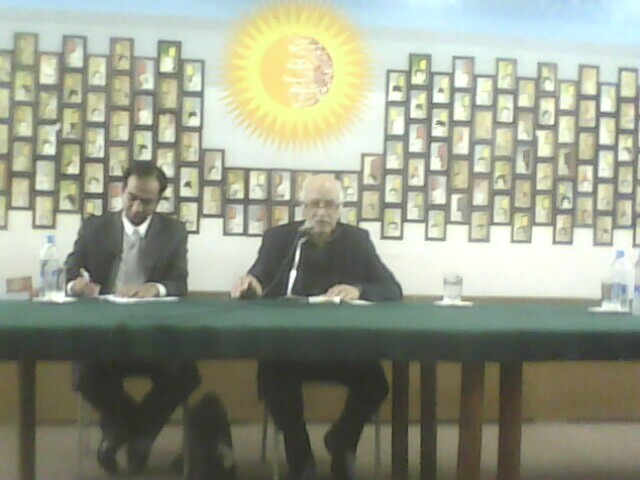 It has been quite some time since I last attended a function of sorts at the Pakistan Academy Of Letters, so when I received this sms of invitation from Khurram Khiraam Siddiqui, the PAL editor of English I had to go there for one doesn’t always come across a person of the stature of Zulfikar Ghose, the US based poet, novelist and essayist, whom the gathering was arranged for. I was fortunate to arrive earlier at the Editor’s office, meet the honorable Ghose sahib and exchange some pleasantries with him. Thats where I got my hands literally on a copy of the biannual anthology of the Pakistani writers, ‘The Pakistani Literature’ where translations from a variety of Pakistani languages as well as original English works of the prominent Pakistani literati are published. 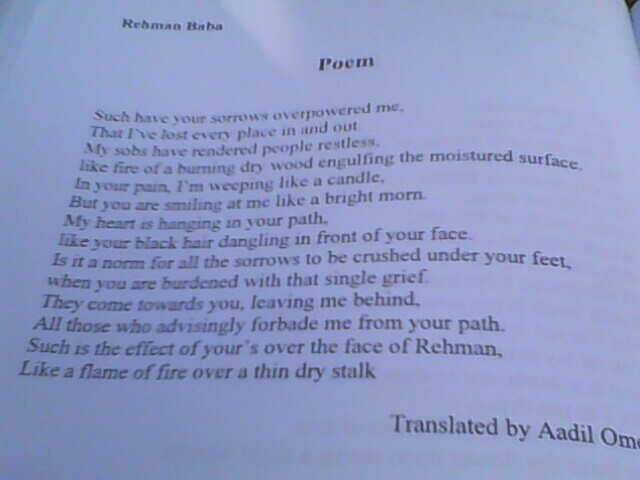 I flipped through pages and was pleasantly surprised to see the publication of four of my translated poems from Pushto. I conveyd my gratitude to Mr. Khiraam who enhanced my delight by showing me a heavier anthology which included pieces of translations as well as a selection of the original Pakistani English literature from 1947 to 2010, that again included a translation of mine. I requested for the contributor’s copies which the Editor generously handed me with compliments. The function itself was a wonderful experience. 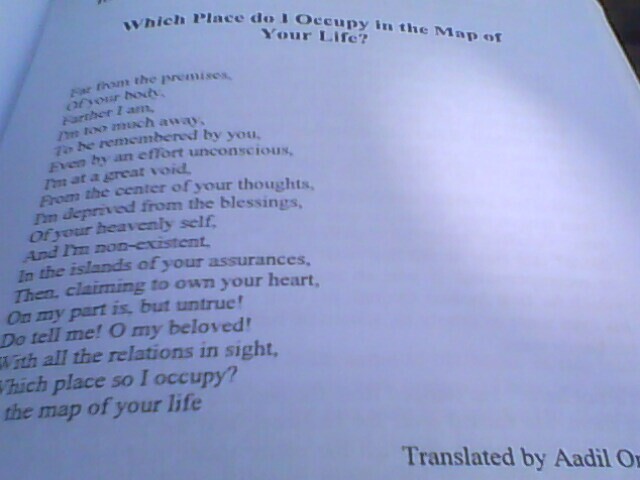 Ghose sahib recited poems from his latest collection called ’50 Poems’ published by the Oxford University Press. In between the recitals of his inspiring poetry Ghose sahib delighted us with interesting anecdotes pertaining mostly to his experiences in life. There was a question-answer session in the end which again was full of information as we came to know how writers born in the third world are assigned labels in the West and how it limits the scope of a writer. It was an evening to remember and one would like to be a part of such enlightening gatherings more often. 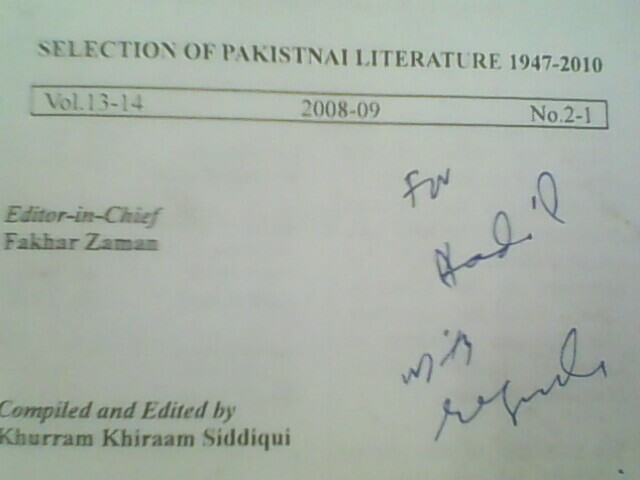 Many Thanks for writing such a beautiful account, giving my pic with Ghose Sahib and also the scanned covers of my Journals, Pakistani Litertaure.However, with Editor(English), I would appreciate if you write my name as well and give a caption to the pic.I would continue to hold these wonderful literary events and they become wonderful with the participation of the friends of literature like you. You are the part of my Forum i.e. Pakistani English Forum and I , with your cooperation and participation will hold English literary programs on monthly basis.It was really a memorable evening. Now I’m even more surprised to see you here, Mr. Khiraam! I’m rather delighted to have your feedback. Yes I’ve been guilty of ignoring the detail including the mention of your name and the caption to that photo etc, but I could be forgiven for the fact that I had to write this post in a hurry before the looming office work to consume me. But its never too late, I’ll definitely alter this post as per your suggestions. It has always been a pleasure to be around you people who inspire and motivate one to carry on with one’s little efforts in creativity and learning. I’m looking forward to the future engagements with you people. You definitely deserved it and you are worthy of even more. Wish you success and prosperity in future endeavors and blessing of Allah in afterlife. Good to know that you enjoyed the tranquil evening and company of really good people. I can’t thank you enough, for your kind words of encouragement. Wow, that must have been such a special even for you! Congratulations!!! Keep up the good work; may Allah bless you with more talent and success. Now work on getting YOUR original stuff published! Yes, I hope to improve and get my original work published somewhere in the future. Thanks 🙂 Yes I will try to come up with something of my own.